The process of stealing the cannon began by gathering the necessary equipment needed, which included two teams of horses and wagons borrowed from a farmer who lived north of town. Because the students feared being caught, they removed the rifle section from the carriage and loaded it in one wagon and attached the carriage to the other wagon. The male students ended up dropping the rifle into the mud when attempting to load the cannon into the carriage because they did not account for the weight (816 pounds) of the rifle. After an hour of struggling to remove the cannon from the mud, the students were able to place the cannon into the bed of the wagon. While, transporting the carriage and the rifle to Cedar Creek, the students decided to take two separate routes to avoid being caught. Once reaching Cedar Creek, they burnt the carriage to lessen the difficulty of hiding the cannon. The students dropped the cannon into the creek by pushing it off of the bridge. Unfortunate for the nine students, the rifle end of the cannon was above the surface of the water; therefore, they had to drag the cannon fifty feet down stream into deeper water. By the time they had dragged the cannon downstream, it was dawn. They knew they had to hurry back to town to avoid being caught. The orange and blue paths on the map indicate the two routes that were taken by the nine males from the class of 1904 when transporting the Cannon to Cedar Creek. 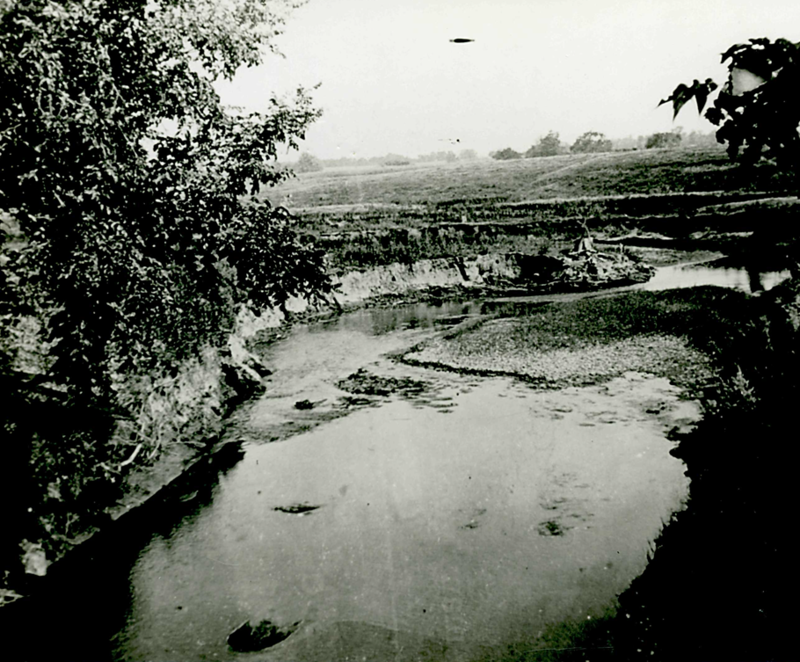 The cannon was dumped over the bridge into Cedar Creek. 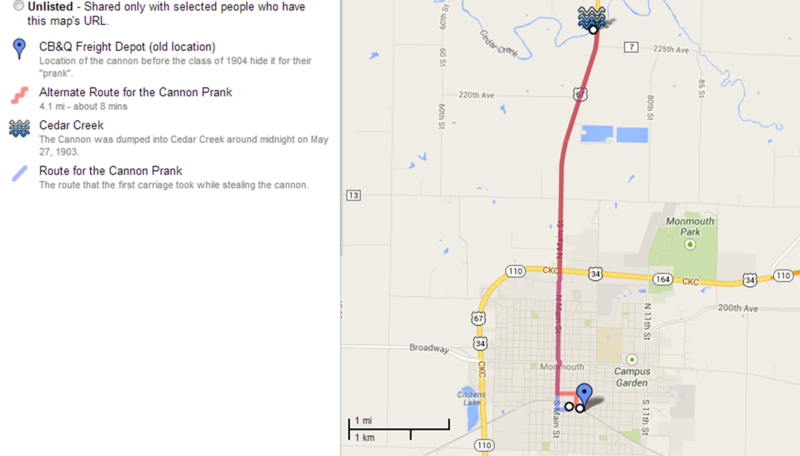 The two locations of the "Hidden Cannon" in Cedar Creek. 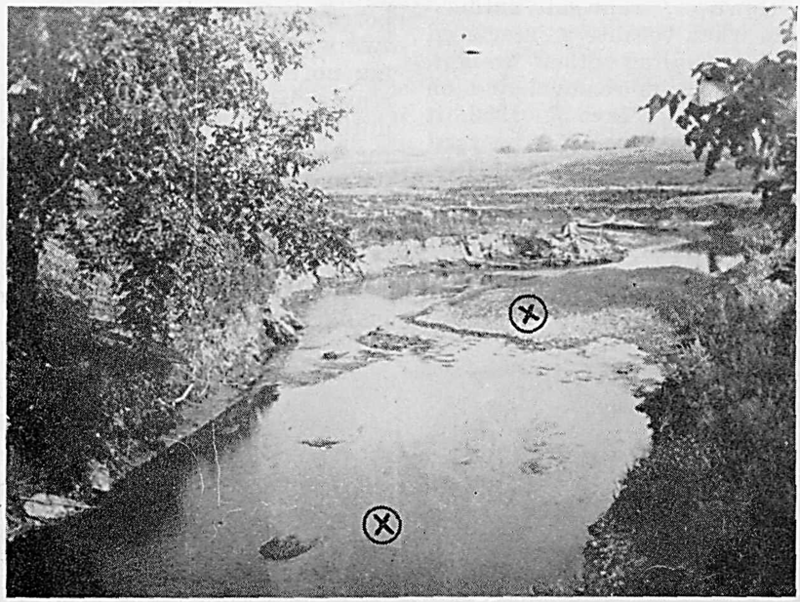 The Cannon was first hidden in Cedar Creek where the foreground "x" is in the picture, and the second "x" represents the second location of the cannon when it was moved into deeper water. 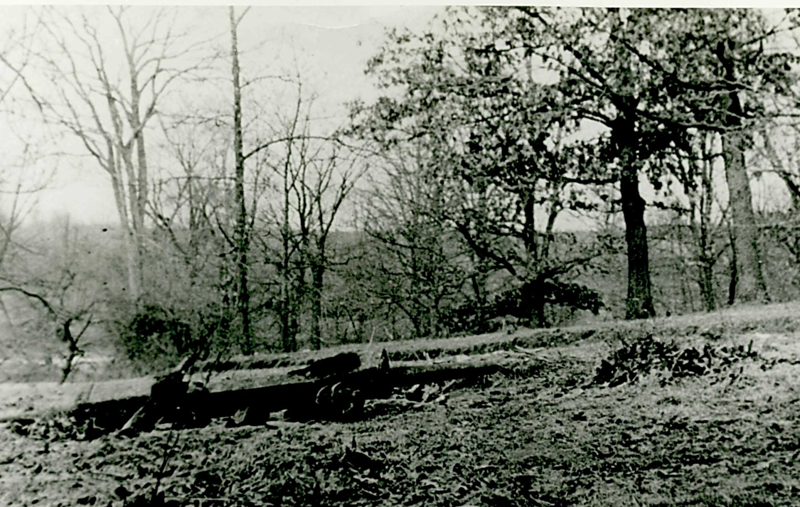 Picture of Cedar Creek from the approximate position of the cannon's burial. The wooden portion of the gun carriage was burned; however, there still remains the metal sections that was abandoned. Jeff Rankin describes the night of April Fool's Day in 1903 when the "ring leader" and eight fellow students of the class of 1904 stole the cannon.